It used to be that the only way to get your memoir published was to be a famous person or an interesting writer or to have such an interesting life that someone else wanted to write your memoir for you, as told to style. The truth is that a lot of people have had interesting lives and it is too bad that more of them don't write memoirs, but then, what would we do with billions of memoirs. Where would we store them all? And if you think about it, a lot of the memoirs would be more or less similar or at least that is what people think. And so, hardly anyone writes memoirs at least in statistically significant numbers and instead of there being a vast and repetitive glut of memoirs, there's a vast array of lives that have never been documented in print. So it seems that Andrew Gronholdt had the sense that his life lived mostly in the Aleutians during a time when traditional Aleut culture was rapidly being overcome by the mainstream American culture might be worth putting down in writing. Apparently, Gronholdt worked at his memoirs but but died without getting them published. According to the book, Gronholdt's daugher, Sharon Gronholdt and her friend, Mike Livingston decided to edit Andrew's writings, lay out the book, add photos, many of them taken by Andrew and publish the book themselves though Blurb, a print on demand publisher. So there it is. Mike Livingston sent me a copy. I have leafed through it, looked at the pictures and started reading it. The title and the cover picture both made me think that the book was primarily about bent wood hat making. But it isn't. It's about Andrew Gronholdt's life just off the Alaska Peninsula in the north Pacific in the Shumagin Islands, the place where Vitus Bering discovered Alaska and sea otters and set off the chain reaction that led to the colonization of Alaska by the Russians. The Russians sold Alaska to the Americans who then began to work on Americanizing the native population. By the time that Andrew Gronholdt was born, the Americanization was just about complete and much or even most of the Aleut culture was disappearing. 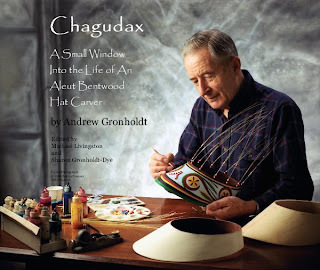 Andrew Gronholdt, however, must have had a sense that the culture needed preserving or in the case of wooden hat making, reviving from the death it had suffered a few decades earlier. The book is lavishly illustrated with photos as well as some of Andrew Gronholdt's sketches and working designs for various Aleut inventions, not only the hats but also bailing pumps, fox traps and other things that Andrew was interested in. The book at a price of $109 a copy is probably not within everyone's budget, but if you are interested in Aleut or Alaskan history at the beginning of the twentieth century, you may want to talk your library into getting a copy. Or if you do have the $109 you can get a copy at Blurb. By the way if you think your own life or the life of someone you know is worth documenting, co-editor Mike Livingston encourages readers to just do it and put together a book and publish it through Blurb or one of the other self-publishing houses. We probably don't need everyone to write a memoir but a few more might give the humans of the future a bigger window into the past. Why Are Sea Otters so Cute? Whatever Happend to Do It Yourself?